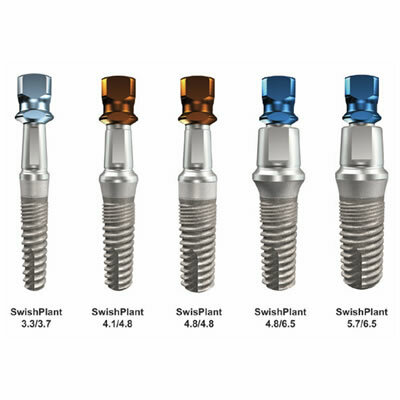 SwishPlant tapered, self-tapping implants with progressively deeper buttress threads offer compatibility with StraumannÃ¢â'¬â'¢s tissue-level implants. Available in 5 diameter and 5 length options, they have microthreads for stability and double-lead body threads for fast insertion. A fixture-mount that serves as a transfer and can be shortened for use as a straight abutment, snapon comfort cap, cover screw, and 2-mm healing collar are included.